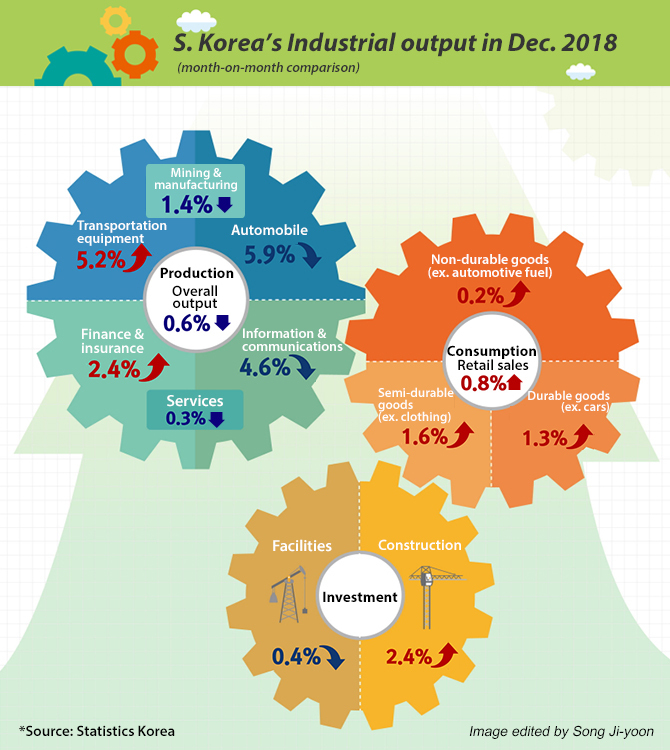 South Korea’s industrial output extended weakening in December to reflect the downtrend in the chip segment with indicators for present and future economic activities in the longest slump since the oil crisis of the early 1970s, raising alarm about a recession in the making. According to the country’s monthly and full-year industrial data released by Statistics Korea on Thursday, seasonally adjusted mining and manufacturing output in December fell 1.4 percent from the previous month due to setbacks in major industries – automaking (down 5.9 percent) and semiconductor (down 4.5 percent.) Against a year ago, factory output rose 1.6 percent. The manufacturing activity mostly reflected the downturn in mainstay chip segment. Factory operation averaged 72.7 percent, down 0.4 percent on month. Inventory level gained 2.2 percent from the previous month. Capital investment sank 0.4 percent on month and 14.5 percent from a year earlier on a sharp drop in machineries and equipment investment. Service sector output fell 0.3 percent on month. Retail sales, a barometer for private consumption gained 0.8 percent on month, extending growth streak for the third straight month. Both coincident and leading indicators, which measure present and future economic activities to suggest the direction of where the business cycle is at or heading, continued southbound move in December. The coincident index fell 0.2 point to 98.1, marking its ninth straight month of decline. The leading index retreated 0.2 point to 98.5 percent, slipping for the seventh straight month. It is the first time for two indicators to concurrently fall for seven months in a row since the early 1970s when the global economy was shaken with oil crisis. In OECD metrics, a figure below 100 indicates that the economy is slowing. For full 2018, the mining and manufacturing output grew 0.3 percent from a year earlier on gains in semiconductors and chemical shipments. Factory operation rate averaged 72.9 percent, retreating from 73.2 percent a year earlier. Service sector output grew 2.0 percent on year on gains in social and health welfare sector. Retails sales expanded 4.2 percent on year, recording the sharpest gain in seven years as private consumption expanded across the board – from non-durable goods like cosmetics to semi-and durable goods such as clothes and cars. Capital investment contracted 4.2 percent from a year earlier on reduced orders for machineries. The on-year fall was the largest since the 2009 or at the time of global financial crisis.